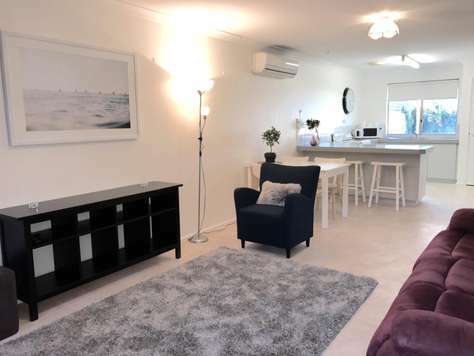 This welcoming three bedroom apartment has been recently renovated and is ideal for a family holiday in Bunbury, the gateway to the South West. There is also a 2 bedroom apartment right next door also available for short stay if you have two parties wanting to holiday together. Accommodation consists of a queen bed in the master bedroom, a double in bedroom 2 and twin beds in the third bedroom. There is a spacious backyard with BBQ and a single car lockup garage provided for parking. Pet friendly. Late check out for weekend bookings - whatever suits! 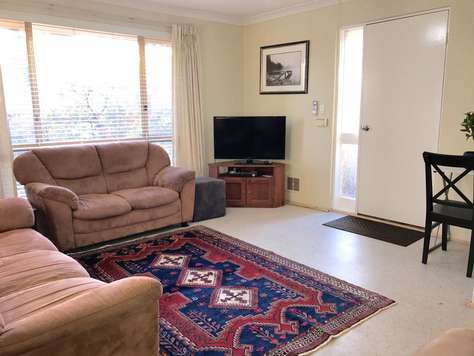 This welcoming two bedroom apartment is ideal for a family holiday in Bunbury, the gateway to the South West. There is also a 3 bedroom apartment right next door also available for short stay if you have two parties wanting to holiday together. Bunbury is a cosmopolitan regional city that is full of life and offers a diverse range of holiday experiences. Situated on a peninsula, Bunbury is an aquatic playground, with the surf beaches of the Indian ocean, the tranquil waters of Koombanna Bay and the Leschenault Inlet providing a range of water based holiday fun. A beach for everyone! Calmer waters at Koombanna Bay for younger children, and surf beaches for older children. Accommodation consists of a double bed in the master bedroom, and twin beds in the second bedroom. There is a spacious backyard with BBQ and a single car lockup garage provided for parking. 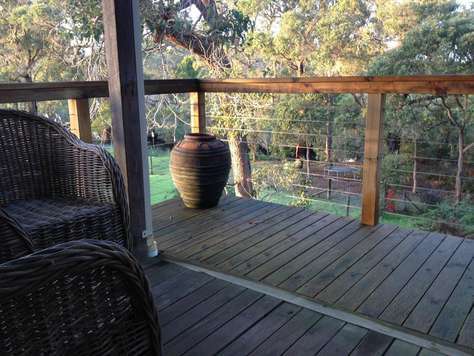 This welcoming 3 bedroom cottage has been lovingly built by the owner to provide a tranquil retreat for a family holiday in the Albany region. Snuggle by the wood combustion stove in the cooler months, and BBQ on the elevated deck in the summer. Accommodation consists of a queen bed upstairs in the mezzanine. Downstairs there is a double bed in bedroom 2 with french doors leading out to the river side deck, and a single bed with an additional trundle bed. Tucked away in a tranquil setting, this property is only 10 minutes to famous MIddleton Beach and Emu Point. Not suitable for children younger than 4 years of age unless you can keep them from the stairs and pot belly stove. Well behaved outdoor pets allowed on request. We will provide a bucket of linen for your use including sheets, pillowcases and towels. This will be left just inside the door for you on arrival. Please return the linen to the bucket upon departure.There are blankets and doonas if you need them.